For years now, largely in the wake of the success of the Shrek franchise, Hollywood studios have been trying to find new ways of updating fairytales for modern audiences, offering ironic and vaguely post-modern versions of timeless stories. It's not hard to see the appeal for the studios: pretty much everyone knows the story of Snow White, Cinderella or Jack and the Beanstalk, the stories are all in the public domain so multiple studios can makes films based on the same source material without having to worry about pesky legal issues, and, unless there is a vocal contingent of Brothers Grimm fanboys and girls out there that I am not aware of, no one is likely to kick up a fuss if film-makers decide to mess with the established formula. After all, the appeal for audiences lies in seeing how an old story can be spun in a new way, much as the original stories were told and re-interpreted countless times over the centuries. 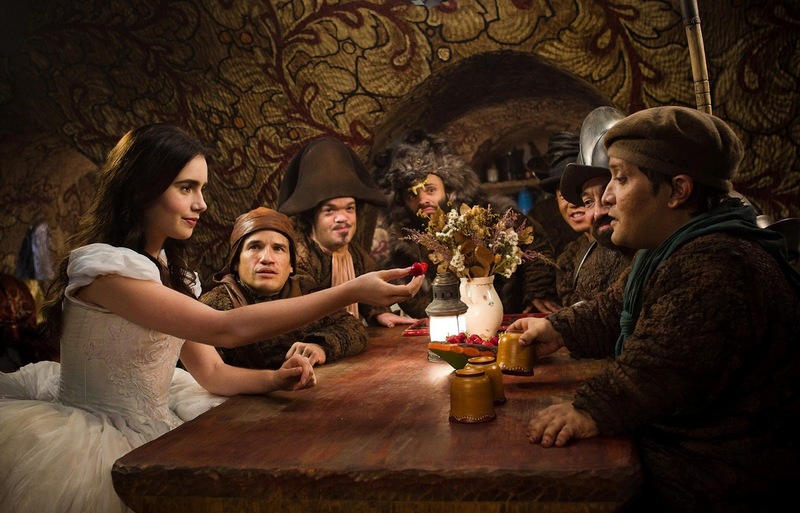 Mirror Mirror seems, at least initially, like it is going to offer a drastically different take on the Snow White story by telling it from the perspective of the wicked Queen (Julia Roberts). Following a brief prologue in which the familiar tale of how she got to be queen is told using marionettes - a rather beautiful little sequence that seems to owe a debt to the opening scenes of Hellboy II: The Golden Army - the Queen is introduced not as the force of sheer malevolence that she is in most adaptations, but as a kind of catty diva, one who has kept Snow White (Lily Collins) trapped in her castle both physically and mentally. Her years of bullying and belittling have convinced Snow that she is not capable of leading the country that, by rights, is hers to rule, and the absence of their princess has convinced the people that she is an emotionally and mentally deficient shut-in. By manipulating these perceptions, the Queen has been able to rule unquestioned since the disappearance of her husband. Right from these opening scenes, it becomes apparent that the biggest problem with Mirror Mirror is Julia Roberts' performance as the Queen. The film strives for a tone that mixes adventure with a wryly satirical undercurrent, and for that to work the character of the Queen, who (in the early going at least) acts as the driving force of the story, has to be both menacing and funny. It's a difficult blend, but not impossible to achieve: it'd be easy to imagine Angelica Huston circa The Addams Family being perfect in the role, for example. However, Roberts' bitchy prima donna act is not as funny as the film thinks it is or needs it to be, and whenever the film focuses on her attempts to woo a visiting prince (Armie Hammer) in order to secure the financial security of the kingdom she has nearly bankrupted, it loses any comedic momentum. More importantly, since most of the film's energy is expended in trying to make her seem funny, it never sells the idea that she is meant to be a genuine threat to Snow White's life. By never being terribly amusing or terribly threatening, Roberts' Queen winds up being a terrible drag on the film. The best thing that could be said of her role in the film is that, since she spends most of her scenes inside the castles, it shows off the terrific set design and visual flair so often associated with the director, Tarsem (The Fall, Immortals). Whenever the film is able to move away from The Queen and her romantic endeavors, it manages to more ably achieve its mix of fairytale and commentary, as well as to subvert the typical elements of the Snow White story. After the Queen's chief servant, Brighton (Nathan Lane) allows Snow White to escape, she meets up with a team of dwarfs who have been acting as bandits in the woods surrounding the castle. Using nifty accordion-style stilts that allow them to nimbly rob those they encounter, they have been able to survive well enough, despite being shunned by the villagers who they once considered friends. Rather than just becoming a servant to the dwarfs, Snow White is trained as one of their own, though only after she convinces them that the should only steal from the Queen. This is probably the most daring change to the story since it gives Snow White, who is often such a passive figure, a great deal of agency since she has to learn to fight to be of any use, and she gets to show off the leadership qualities that she has long neglected whilst trapped in the castle. It is this aspect that leads her into conflict with the aforementioned Prince, who sides with the Queen as a result of being ambushed by the dwarfs early in the film, and the sword fights between Collins and Hammer are some of the best parts of the film, allowing the two to display considerable chemistry in a way which is fun, lively and kinetic, as well as a touch risqué at points. Collins and Hammer are the standouts of the film since they are able to sell both the jokes - Hammer, in particular, gets some very funny moments after he has been given a Puppy Love potion - and the emotion behind them. At their best, their scenes recall the duels in The Princess Bride, and there can be no higher praise for a subversive fairytale film than that. Unfortunately, the film isn't just about them, it's also about the Queen, and she turns up to spoil the film at every available opportunity. Whenever the story lurches back to focus on her, it becomes desultory and unfunny, with the constant attempts to shoehorn in references to modern life get old very quickly. By the time the film brings her directly into the conflict, it's almost impossible to seriously consider her a threat, as opposed to a bland cartoon who has wandered in from a different movie. It also doesn't help that the final battle between Snow White and the Queen involves some distractingly bad CGI, but as ever with these things, bad effects are forgivable if they are in service of something interesting. Though it has some very strong elements, namely the Collins and Hammer, the comic interplay between the dwarfs and the overall design of the film, it never overcomes the fact that it is a film that wants to show us more of the Queen's point of view, but fails to make that point of view funny or engaging. It mainly left me wishing that Tarsem had decided to adapt Neil Gaiman's "Snow, Glass, Apples" instead.